Just Ask Me…I Mean Him. For the past two months our Women’s Bible Study Group has been digging into the book of Jeremiah. I remember sitting on the floor in Lifeway Bookstore with 10 different Bible Studies surrounding me – praying for God to lead me in choosing the one that our women needed the most at this moment in time. Little did I know that in choosing Jeremiah – it wouldn’t just be something that our Haitian women could glean from – it would be exactly what I needed as well. You know – the teacher becomes the student. The thing I love about Jeremiah is that he has such an open and honest relationship with God. It feels like he’s just being “real” as you read throughout the scriptures. You’ll read through certain parts of scripture where he is praising God and rehearsing what he knows to be true about His character – – – then a little later he’s questioning God’s motives/discipline – -a little later he’s complaining about how hard his life is – and then later again he’s remembering God’s faithfulness. on the peoples that do not call upon your name. Jeremiah 14:19-22 Lord, have you completely rejected Judah? Do you really hate Jerusalem? Why have you wounded us past all hope of healing? We all have sinned against you. 21 For the sake of your reputation, Lord, do not abandon us. and do not break your covenant with us. 22 Can any of the worthless foreign gods send us rain? for they worshiped worthless idols. 20 Can people make their own gods? Jeremiah 32:16-20 16 Then after I had given the papers to Baruch, I prayed to the Lord: 17 “O Sovereign Lord! You made the heavens and earth by your strong hand and powerful arm. Nothing is too hard for you! 18 You show unfailing love to thousands, but you also bring the consequences of one generation’s sin upon the next. You are the great and powerful God, the Lord of Heaven’s Armies. 19 You have all wisdom and do great and mighty miracles. You see the conduct of all people, and you give them what they deserve. 20 You performed miraculous signs and wonders in the land of Egypt—things still remembered to this day! And you have continued to do great miracles in Israel and all around the world. You have made your name famous to this day. 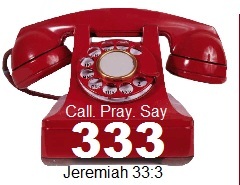 Jeremiah 33:3: Ask me and I will tell you remarkable secrets you do not know about things to come. It doesn’t say ask your husband – your children – your friends – your family – your neighbors – your best friend’s cousin’s step-brother…… it says ask God and He will tell you. The problem with asking God is that sometimes it’s not as fulfilling as asking everyone else. When you ask everyone else – they give you a response right away. You feel affirmed or at the very least – heard. Many times you’re told exactly what you wanted to hear. Other times your friends may warn or caution you. Either way – by watching facial expressions & listening to the tone of voice – you walk away feeling something. But when it comes to talking to God – asking him about these “things to come” – it’s crickets. Or at least it feels that way. When we don’t hear right away – when we feel like we’re being ignored & becoming impatient – we begin to make up rules or look for signs. If I walk into my house and my tennis shoes are not in the front room – then I know I’m not meant to go exercise today……maybe it’s a sign I should NEVER do it at all. (which is a great sign for me since I don’t have a pair of tennis shoes in Haiti). Or if I get to work and one more person comments about my hair – I’m dying it red. Or if I go to the store and the jewelry I want is 30% off – then I’ll know God wants me to buy it. We search for signs….. and then make up the rules to go with it. It’s quite possible that there’s a sale going on at JC Penny (normally every day is the biggest one of the year) and God STILL doesn’t want you to buy that watch. He didn’t come up with that rule about the sale – you did. I’m really guilty of looking for signs to confirm what God wants me to do. I’m also really guilty of deciding what those signs should be. As we listen to God’s voice about how we should spend our time, what job we should do, whether to adopt, how we should spend our money, what ministry he’s calling us to, what kind of education is right for our children – we need to look for God to confirm His messages in our lives in His way. One thing for sure – it will never contradict His Word. When I stop seeking signs from the universe….. Most often in my life God uses His WORD to bring confirmation. Whether I receive a confirming word in a sermon, through a friend, in my personal Bible Study, at a conference – – it’s often too clear to just be a coincidence. Have you ever read something in the Bible and even if you have the verse memorized all of a sudden it means something else? That’s not a coincidence. Our God loves to show himself real to us when we listen for His voice. When we seek Him for real confirmation (though we may grow impatient) we will find Him faithful. Ask God to give you clear leading in whatever areas of your life you are seeking answers for. Like Jeremiah – bring Him all your questions and complaints, and then rehearse to yourself what you know to be true about Him. Be sure to ask Him to give you patience & mercy of confirmation – so that you may know you are on the right track of obedience.